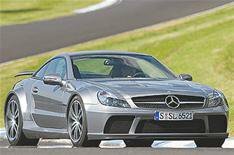 SL65 blows away AMG power record | What Car? This is the Mercedes-Benz SL65 AMG Black Series the most powerful AMG model ever built. The two-seater weighs just 1870kg thanks to extensive use of carbonfibre. It's powered by a 657bhp 6.0-litre V12 and has had its pulling power limited to 737lb ft. That gives the car a 0-62mph time of 3.9sec and a limited top speed of 199mph. Mercedes says the engine could punch out 885lb ft of pulling power if it was left unlimited, but has wound it back to ensure the car remains driveable. The five-speed automatic gearbox has four modes: C, S, M1 and M2, each sportier than the other. Likewise, there are three stability control settings depending on how brave the driver wants to be. To stop the engine overheating, the bonnet has several apertures to allow cooling air into the engine bay. Other features include a retractable rear wing that rises at speeds above 75mph, a rear air diffuser, 19-inch alloys on the front and 20-inch alloys on the rear, and a sports exhaust. The suspension can also be adjusted according to the driver's tastes, although Mercedes says this is more likely to be useful at track days. Pricing and an on-sale date have yet to be set.